All items shown in the museum are from my personal collection and are not for sale. Review: Kentucky Derby Glasses Price Guide - A Comprehensive Guide to Collecting Kentucky Derby Mint Julep Glasses and Shot Glasses edited by Judy Marchman. This new 2008 edition is an invaluable tool for anyone who collects Derby, Preakness, Belmont, or Breeders' Cup glasses and shots. Photos of everything included! The newest craze in racing memorabilia collectors is bobble head dolls. So far seven of the wobbly headed caricatures of famous jockeys and trainers have been given out as racetrack promotions since 2001. Here is the Jerry Bailey bobble that was given away at Saratoga on July 28, 2002. See photos of each, quantities made, pricing info, and where you can find them here. Copper washed metal horse and jockey with a clock inside a horseshoe and rose wreath on a wooden base. The electric clock is by Sessions and still runs. The latest patent date is 1937 and the figurine bears a strong resemblance to Eddie Arcaro and Whirlaway in the 1941 Kentucky Derby winners circle photo. For more unusual racing collectibles, check here. The first glass issued was 1938 and there was no decorated glass made for 1946 and 1947. Due to shortages during World War II, aluminum and bakelite (an early plastic) were used in 1941 through 1944. The 5 glasses shown are worth about $1300 total, with the rarest being 1950 and 1951. There are glasses for the other Triple Crown races, the Breeders Cup, and many other races. Here is a selection of them. 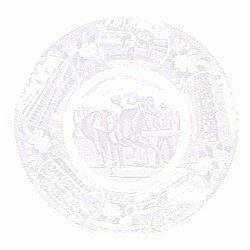 If you are looking for info on the 1974 Kentucky Derby glass variation, check here. Shot glasses have become increasingly popular in recent years. The Kentucky Derby in particular exploits this by putting out several different ones each year. So far the other races are still doing just one. Here is all the 96 KY Derby shots and a selection of others. Another popular collectible is pins. The one shown here is a 1985 Kentucky Derby pin, which is a rarity since the first authorized logo pin came out in 1987. It is linked to a page with more pins of all types. Rolling Rock did many advertising signs featuring famous race horses and an entire series on Kentucky Derby winners as did many other companies. Here is a selection of other signs and mirrors. This one is from 1981 and features Genuine Risk in the 1980 Derby. These started in 1977 and were discontinued in 1990. Each has a scene from the previous year's Derby in the center and the same 5 scenes around the edge: Dreaming About the Derby, Home Stretch at the Derby, Clubhouse Grounds and Paddock, Around the First Turn, and In the Winner's Circle. Check my plates page for many more plates of various types, including Reed & Barton, Fred Stone, and many others. This also comes in a miniature size. There is a similar decanter for Cannonade from the same company. This is a much more detailed decanter than the Jim Beam decanters and looks more like a figurine. Here is a page with lots more decanters from Jim Beam, Ezra Brooks, etc. Phone cards are something fairly new on the scene. Already a hot collectible, there are now quite a few horse racing ones coming out. The one pictured is of Cigar and the page it links to has a bunch more on it. Of course I can't leave out my postcard pages from the museum. I am up to 6 pages and over 100 postcards now.